As so often repeated these days, data is the new fuel for the digital age. Considering the wide spectrum of opportunities Open Data may bring, it is no surprise that the EC plans how to keep shaking up the way public authorities share data. The following lines aim to be an overview of the EC developments so far on Open Data and Public Sector Information, as well as a review of future planned actions. The EC organized the first Digital Agenda Assembly in June 2011 to discuss advances with regards to the Digital Agenda objectives for Europe. With that aim, twenty-four thematic workshops and two plenary sessions were conducted. One of those events was the Open data and Re-use of Public Sector Information workshop, where different types of stakeholders congregated to collaborate with the Commission on developing its strategy for Open Data in the EU. Khalil Rouhana (DG Information Society and Media Content & Cognitive Systems of the European Commission) made several key announcements in relation to Open Data policies in the EU during that workshop. We will focus briefly on these in the forthcoming sections. 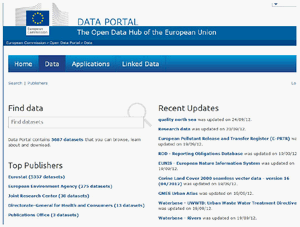 The European Commission Open Data portal data.gov.eu, a portal easing the search for Commission data, as well as other EU institutions, bodies and agencies to citizens and industry. The portal, currently under developement, is expected to be released soon in 2012. Pan-European Open Data portal, to make data from EU, national, regional and local administrations more easily available and re-usable. A prototype is expected to be released in 2013. Including new bodies in the scope of application of the Directive such as libraries, museums and archives. Determining limits on the fees that can be charged by the public authorities at marginal costs. Introducing independent oversight re-use rules in the Member States. Making standard machine-readable formats for information held by public authorities. The previous studies on the goals and requirements for the pan-European Data portal and the associated technical workshop. Analysis on how to publish PSI in a proper way. Workshop on Removing the roadblocks to a Pan-European market for PSI re-use. LOD2 – aiming at increasing public access to high-value, machine-readable data sets. Linked Open Data Around the Clock (LATC) – a Support Action working on the publishing and usage of Linked Data on the Web. The Technologies for Information Management programme to create intelligent digital objects and knowledge management by supporting knowledge exchange and the semantic web. To create a portal site for Commission-held information aiming at an expansion to other EU institutions, bodies and agencies at a later stage. To work with the Member States on data formats and interoperability between existing sites. To create a Pan-European umbrella site linking information held by EU institutions, bodies and agencies and by Member States. The aforementioned development of an Open Data Communication strategy. The continuous revision of the PSI directive. An EC integrated reuse policy, which recognises the economic potential of re-use of PSI. It is also remarkable to recall the European overall bet for data handling, Open Data and Open Access, not only by Open Data policies and a regulatory strand (PSI Directive), but also by means of research, innovation and ICT deployment pilots and portals implemented through financial support instruments such as the FP7 and CIP-ICT-PSP 2011-13 R&D&I multiple programmes, that are currently almost gone but will have continuity with the new Horizon 2020 programme. There is a strong need to investigate requirements for an European Data License, given that if we want to encourage use and reuse of data across European borders, there may be the need for a single cross-border license. Several questions then arise: Will one of the existing licenses do the job, or do we need a new one? If we do need a license, is there an obvious choice, or is something new required? A first-priority task will be to identify and evangelise Open release of Core Reference Data, given that European Member States have already huge quantities of valuable data. Some of this data is now becoming freely available in certain Member States, but too much of it remains locked up behind odd rules and unsustainable cost-recovery models. It is also difficult to compare data between Member States. In addition to all the work in progress that has been previously mentioned, and as announced by the Vice President of the Commission Mme Neelie Kroes, the EC also plans to continue developing their European strategy for the publication and reuse of public sector data from European institutions and the Member States, as established with Commission’s commitment to turn public data into business included in action 3 of the Digital Agenda for Europe Communication. The provision of data preparation, transformation and publication services, with a commitment to publish at least 15.000 new data sets from all EU Member States in machine readable formats, including Linked Open Data technologies. Training services in the area of Open Data, in particular to favour the uptake of Linked Open Data technologies by public bodies within the European Union. Provision of an IT advisory and consultancy service in the area of Open Data, and in particular on Linked Open Data technologies, including specific software development tasks. Financial support instruments will continue to support several Open Data developments, notably, the FP7-ICT Work programme 2013 will help Small and Medium Enterprises (SMEs) to develop innovative applications in structured and unstructured digital content management and, particularly, in the reuse of open data through an Open Data Incubator. Solicit open data reuse ideas from the general public and conduct a European wide open data reuse information campaign. Publish and manage regularly scheduled calls for SMEs to submit mini-proposals to be funded for a period between six and twelve months. Create a computing infrastructure where the winning mini-proposals will find accurate and up-to-date versions of the data they need for their services. Establish a mechanism for connecting open data demand and supply by systematically contacting European public bodies for their open data and assisting them in the efficient and sustainable publication of such data. In response to the increasing clamour in search of harmonising Open Data initiatives, the European Union is financing projects such as “Harmonising Open Data in the Mediterranean through better access and Reuse of Public Sector Information – Homer”, which aims mainly to set up an effective strategy able to harmonise Open data policy and portals across the Mediterranean area, supporting regional and local governments. Cultural Data: The EU’s digital libraries initiative sets out to make all Europe’s cultural and scientific resources accessible to all, and preserve them for future generations. In this area it should be pointed out that recent Europeana’s move to CC0 is a step change in open data access, given that releasing data from across EU country sets an important new international precedent and a decisive move away from the world of closed and controlled data. Smart Cities: One of the greatest challenges facing the EU is how best to design and adapt cities into smart intelligent and sustainable environments. Smart urban technologies can make a major contribution in tackling urban challenges by breaking down boundaries between the sectors involved, ensuring adaptable and interoperable solutions and finding a way to use data transparently and openly, without breaching privacy. Open Science: The European Commission outlined measures to improve access to scientific information produced in Europe. Broader and more rapid access to scientific papers and data will make it easier for researchers and businesses to build on the findings of public-funded research, boosting Europe’s innovation capacity and give citizens quicker access to the benefits of scientific discoveries. The Commission will make open access to scientific publications a general principle of Horizon 2020, the EU’s Research & Innovation funding programme for 2014-2020. The Public Sector Information Group, an PSI expert group which includes representatives of 27 Member States that was set up by the EC to exchange good practices and initiatives supporting public sector information re-use and discuss and recommend solutions to challenges such as charging, exclusive agreements, development indicators for measuring public sector information and technology. LAPSI, The European Thematic Network on Legal Aspects of Public Sector Information to become the main European point of reference for high-level policy discussions and strategic action on all legal issues related to the access and the re-use of the PSI, namely in the digital environment. The European Data Forum, with a first meeting in Copenhagen (June 2012), and the next scheduled for Dublin in April 2013. It is a forum in which business actors, including a large number of SMEs, researchers and other stakeholders can come together to work out what a data economy really looks like. The EPSI Platform is Europe’s One-Stop Shop on Public Sector Information (PSI) Re-use which objective is the promotion of a dynamic PSI re-use market across the EU, a place where the different stakeholders can get all the relevant information about the European and international PSI re-use developments, emerging good practices, legislation, legal cases, examples of PSI re-use products and services, etc. The Platform provides news on European PSI developments, legal cases around re-use, good practices and examples of new products and services, covering the main PSI re-use markets. It follows and reports on a daily basis the developments of the PSI re-use/open-data/government-data policies, initiatives and/or projects in the EU and elsewhere. This entry was posted in Dissemination, English, Europe, Legal, Linked Data, Open Data, Policies, Strategy and tagged capacitybuilding, da11data, da12data, digitalagenda, dissemination, epsiplatform, europe, legal, linkeddata, opendata, openscience, psi, smartcities, strategy by Carlos Iglesias. Bookmark the permalink.